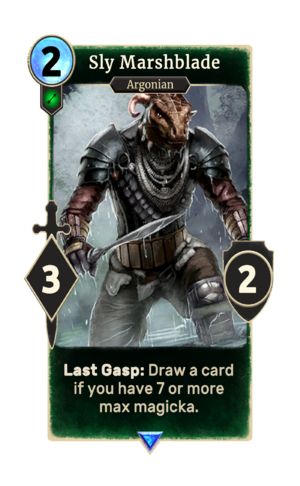 Last Gasp: Draw a card if you have 7 or more max magicka. Sly Marshblade is a rare Agility creature card. It is part of the Forgotten Hero Collection. It is available as part of the Forgotten Hero Collection. This page was last modified on 27 February 2019, at 23:51.